Exhibition can be defined as “a public display of works of art or items of interest, held in an art gallery or museum or at a trade fair” (Oxford Dictionary). British companies have been exhibiting at trade shows and events for hundreds of years to showcase what it is they can do. The Great Exhibition of 1851 in Hyde Park was the first international exhibition of manufactured products (V&A Museum). Although Britain’s main concern was once to promote its own superiority and for visitors to look positively upon British activities (Five Minute History), to this day this still remains one of the best ways to promote your own business. If you are thinking of showing off your business and wish to exhibit, here are 5 tips you can use to help attract attention to your stand at the exhibition. One of the first things that will get you noticed is the use of bright colours to catch the attention of your potential new customers. Different colours are usually associated with different emotions and it is important not to go too over the top. For example, the colour yellow is usually associated with the feelings of warmth, clarity and optimism. If you were going to think of a business associated with the colour yellow, immediately MacDonald’s might spring to mind, or for the colour red you might think of Coca-Cola. Use your brand colours and create an eye-catching experience for your customers, helping to draw them into your booth or stand. Your customers will associate your brand colours with your company and will be more likely to visit your stand, strengthening their loyalty. If your logo or branding is quite simplistic then there is no reason you can’t have a brightly coloured or patterned table cloth or banner to catch your customer’s attention! Think about bringing elements of your company’s products or services to the stand, for example if you are restaurant or café you might want to think about bringing some food samples or doing some taste tests. Who doesn’t love a promotional giveaway? Choosing the right product for the right target audience is always important; it should reflect your business and cohere with your brand image. For example, if you are a technology company you may want to consider giving away a tech related product, such as ear/headphones, USB’s or power banks depending on your budget. If you want to promote a more fun, light-hearted side of your business, then why not try this pop-i screen cleaner. The majority of your customers will have a tablet or computer they need to clean once in a while. If you have a low budget but still want to impress, something as simple as promotional cupcakes or sweets always go down a treat. Pun intended! Everyone needs a stand at an exhibition, if for no other reason than for your customers to find you! They also help to increase the professionalism of your brand, no doubt the majority of other exhibitors will be using them and so you do not want to get lost in the crowd. Using roller banners or exhibition units are a great way to draw attention and promote your company. These can be as large or as small as required and tell your visitors exactly who you are and what you do. That way you are drawing the right prospects to you and not just someone who wants a free goodie. 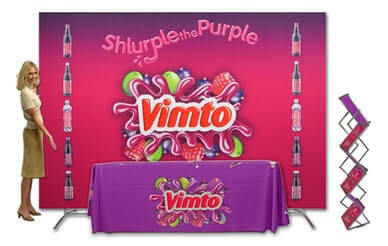 Brightly coloured table cloths are also a great way to draw attention and promote your brand. These are especially a great idea if you have a simple logo and don’t want to have too many colourful giveaways. We would always recommend that you go for a general stand or table cloth with your artwork, branding message and corporate logo, rather than using event specific artwork (such as 2018 Exhibition…). This way you will find that event displays are a great promotional investment, which you can continue to use for every event, time and time again! Don’t have a colourful table cloth, or an eye catching roller banner. Why not dress the part? Matching or colourful uniforms are always a great idea and makes a lasting impression. Your customers would certainly stop and stare. Novelty products and accessories are another idea for your staff and show your customers you have a fun side whilst giving the best customer service they’ve ever received. Watch this quick YouTube video now to see exactly what we mean… A fantastic way to be sure that you will be remembered after the event! There are so many fun ways you can promote your company at an exhibition. We have some fun ideas for your stand… Music! It can get quite loud at exhibitions so why not make some noise and draw some customers in with your cool, upbeat tunes! What about having a bubble machine to reflect your bubbly personalities, or some ‘subtle’ disco lighting – It will certainly get you noticed! It might also be worth considering how you could collaborate with other exhibitors, perhaps within a relating industry or 'shoulder niche', to help draw people to each other’s stands. For example a clothing brand could collaborate with a beauty brand. Get your customers to join in the experience and bring out their competitive streak with games and puzzles, quizzes, prize draws, raffles and more. This helps to create a buzz of excitement at your exhibition booth and entices more people over to speak to you. Request the contact details of individuals that enter into your competition, and make sure you follow up after the event, inviting your new leads to respond to your email and stay in touch; ultimately converting them into sales! 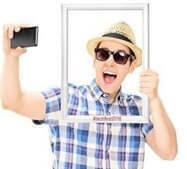 Many of us are guilty of a selfie here and there, so why not capitalise on this with a photo booth or selfie frame branded with your company logo and details. Combine this with a competition and encourage social media sharing with a prize ‘for the silliest selfie’ if they tag and follow you on your social platform of choice. This is a fun, interactive way to connect with customers, whilst having a laugh at the same time. You could also think about getting some selfie props; try looking in charity shops or if you would like logo branded photo booth props then get in touch with us. Sponsoring or supporting a charity will be beneficial for both parties. Not only will you be fundraising for a good cause, but people will be more likely to take part and get involved with competitions and social media sharing if they know that a charitable firm will benefit from it. 82% of individuals would choose to purchase from, or use the services of, a company that engaged with charities, over a company that offers products and services for the same price but does not help community (Real Business 2014). Charitable associations also help to bring PR opportunities, which is another key way to build momentum in the lead up to the event. Add extra value for customers visiting your stand with top facts, hints and tips related to your business industry. Sharing meaningful and useful advice will win you brownie points and help to entice prospects to show an interest in any other valuable information you might be able to teach them. Don’t ignore the potential of attracting existing customers; make sure you raise your profile ahead of the event. It is important for your clients to be aware that you will be exhibiting, to act as advocates for your brand as well as strengthen your current relationships. Follow these steps for your perfect exhibition experience... The most important thing to remember is to stand out and make your company known! Do Exhibitions Really Work? Exhibitions, conferences and trade shows allow for a two-way communication that helps to build and nurture relationships on a more personal and emotional level. They provide the perfect opportunity to market your business and meet new people. According to Richard Branson “no matter how advanced our methods of communication have become, nothing seems to have come close to replicating the value of face to face contact”. Statistically, individuals who participate more in face-to-face networking, get better results from their efforts and 95% say that this direct interaction with clients is essential for long-term business relationships (Virgin 2014). Have you ever wondered ‘if I exhibit at this trade show, will I get my return of investment?’ Well, quite frankly you will never know unless you try! But, there is a high chance that you will due to the fact that generally exhibitions have a low customer acquisition cost. The costs of exhibiting are likely to be outweighed by the high number of new customers and potential leads you acquire very quickly. If you compare this to the alternative of visiting customers and prospects individually, this is of course far more time consuming, and as the saying goes; ‘time is money’. Exhibiting at an event is a great way to increase exposure for your brand, and having promotional giveaways ready to impress customers will maximise your presence. You should also think about combining direct mail, PR and social media to create a buzz in the lead up to the event, which will help to strengthen customers’ enthusiasm about visiting your organisation’s stand or booth. After the exhibition it is important to follow up with the leads you have generated during the event, to ensure you stay in the minds of your new clients and improve the chance of conversions. Bear in mind that sending personalised emails with individual’s names or phoning individuals will gain a better response than a general, group email. Generally speaking, people that participate in exhibitions and events tend to have more of a pro-active personality type rather than passive. They have actively decided to attend the exhibition, meaning that they are likely to show more interest in your organisation and marketing messages. This level of engagement is what makes business and networking events so beneficial. It is also a ‘neutral sales environment’, as the customer is not pressured to purchase and the seller does not have to worry about any concerns with visiting the client at their place of work, instead it is a more ‘meet in the middle’ situation. Don’t forget to also network with other exhibitors who are all in the same position as you, looking to raise their profile and ultimately grow their business. Check the event website prior to the event and see who is exhibiting, making contact with any relevant exhibitors to see if there are any ways you might be able to help each other out. You can also use your time spent exhibiting to carry out some market research, almost like conducting focus groups with potential clients for free! Get the most out of your investment by planning 5-10 questions that you would like to find out and have some in-depth conversations. What about asking individuals what they think about the products and services you offer and how they think you can improve them? It is also vital to do your research prior to the exhibition, to ensure you choose the right event for your organisation, with the right target audience, in order to achieve the maximum potential impact and your return on investment.